"Simply Success: A review of the factors which contribute to the biological, function and esthetic success of implant supported prosthodontics"
Neil Meredith qualified at Guys hospital in 1982. Following a number of appointments in Oral and Maxillofacial Surgery at Kingston and Glasgow Hospitals he set up a practice in Cowes in the Isle of Wight. Neil completed an MSc in Conservative Dentistry at the Eastman Dental Institute in London in 1988 where he remained for six years as a lecturer. He completed his first PhD in collaboration with Imperial College in 1992. In 1993 he became Consultant, Senior Lecturer in Bristol Dental School and was recognized as a specialist in both Prosthodontics and Restorative dentistry by the General Dental Council. Neil’s research interests have focused around biomaterials and biomechanics. In 1992 Neil invented the use of Resonance Frequency Analysis to measure dental implant stability, a technique that has now become the international benchmark known as Osstell. He was awarded his second PhD from the University of Gothenburg for his work in this field. Neil took up the Chair in Restorative Dentistry and Biomaterials at the University of Leeds in 1997. 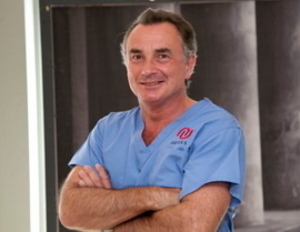 Following his entrepreneurial spirit he invented an implant system, raised venture capital funding and founded the Neoss company of which he was CEO from 2000-2011. 2011 has seen a return to academia with Neil joining the University of Queensland as Professor of Prosthodontics. He has always practiced clinically, most recently specializing in prosthodontics and dental implantology. He is the author of some 59 peer reviewed papers and has lectured internationally on many forums.